We will be leaving Umbria soon and returning to North America for six months, so I am working hard at emptying my freezer before we leave. I had gone picking wild blackberries in the valley behind our property a month or so ago, and now have four bags of blackberries I need to use up in just over three weeks. I can see lots of smoothies in my future! I decided to bake some muffins for our farmhouse guests, and pulled a recipe from my files for a basic muffin. I made a few changes to rebuild the recipe to add more nutritional value, but wanted to make sure the muffin stayed moist and tasty. I genuinely like the texture oat flour gives to baked goods, so I substituted oat flour for half the all-purpose. Next time I make these muffins, I’ll use whole wheat pastry flour as well as oat flour and skip the all-purpose flour altogether. I used low fat buttermilk, and reduced the amount of sugar called for and was very pleased how the muffins turned out. 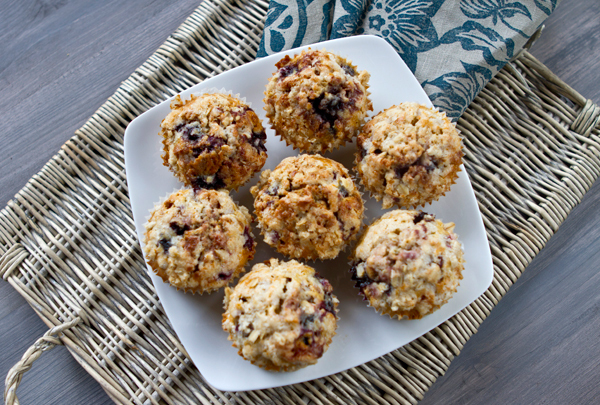 My wild blackberries have both a tart and sweet flavor that truly made these muffins come to life although you could substitute fresh or frozen blueberries or raspberries in place of the blackberries. Using low fat buttermilk in place of regular retains moistness but reduces fat calories significantly. 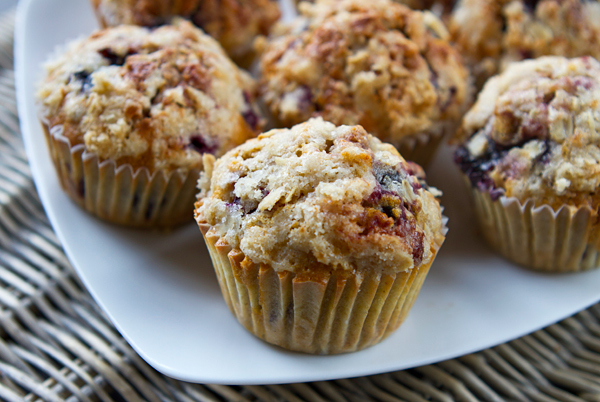 A healthier version of the traditional berry muffin. Preheat oven to 375 degrees F. and lightly grease muffin tin or line with muffin papers. Mix together the topping ingredients with your fingers until crumbly, then set aside. Stir together the flours, sugar, baking powder, baking soda, cinnamon, and salt. In a separate bowl whisk together the egg, butter, and buttermilk, then add to the dry ingredients and stir just until mixed. Stir in the blackberries, taking care not to overmix. Spoon the batter into the muffin cups, then sprinkle the topping on each. Bake the muffins for about 25 to 30 minutes or until set.